Grass grows where you spray it with Hydro Mousse Liquid Lawn. Grass grows where you spray it with Hydro Mousse Liquid Lawn as seen on TV. Go from seed to sod just like the pros with Hydro Mouse the world&apos;s first home hydro seeding system. Now you can get professional results without paying hundreds for professional lawn care. Hydro Mouse Liquid Lawn is perfect for dry patches, dog spots, high traffic areas and frustrating shady sections. And it blends perfectly with your existing lawn. 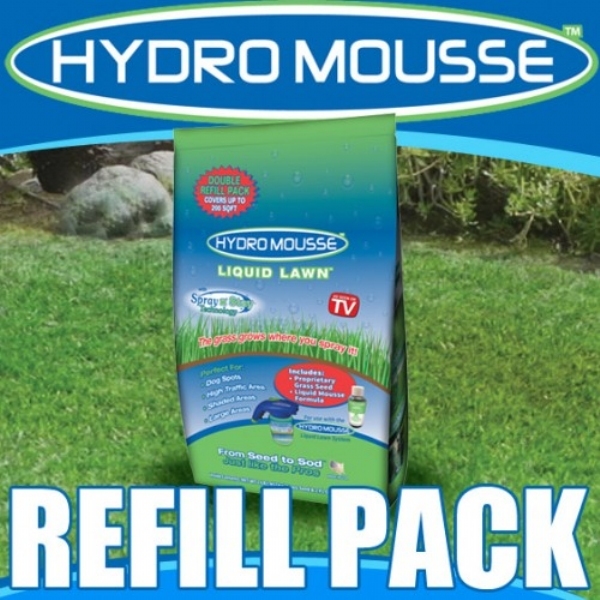 Hydro Mouse Liquid Lawn Refill covers up to 200 square feet. Includes 1 lb. Proprietary Grass Seed Blend and 2 oz. bottle of Magic Mousse Formula. THE PRODUCT COMES OUT GREEN, BUT WONT EVEN TURN THE GROUND GREEN AS IT SHOWS ON TV, SO YOU CANT TELL WHERE YOU HAVE BEEN, MOST OF SEEDS STAYED IN SPRAYER. JUST GREEN DIED WATER IS ALL IT IS, DONT WASTE YOUR MONEY, BEEN 2 WEEKS OF WATERING EVERYDAY AND NOT A SINGLE SPROUT. ALSO SAYS TO LOOSEN GROUND 3 , BUT ON ADD SAYS SPECIAL FORMULA DO PENATRATE INTO HARD GROUND. not as shown is commercial very deceiving! little sprouts of grass here and there. My neighbors compliment my lawn more than just saying "hello"!! Awesome! !